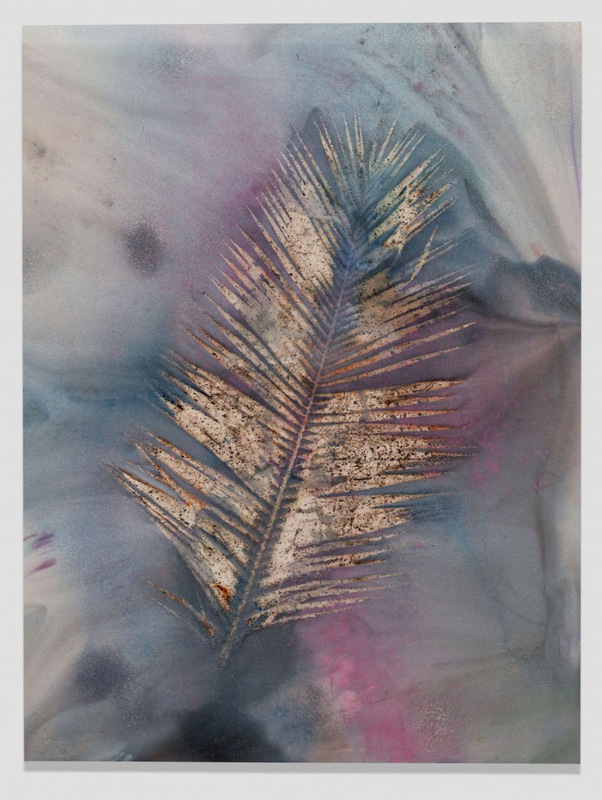 Currently at Gavlak Gallery are Bovey Lee’s amazingly detailed rice paper works for her solo exhibition Divertical. 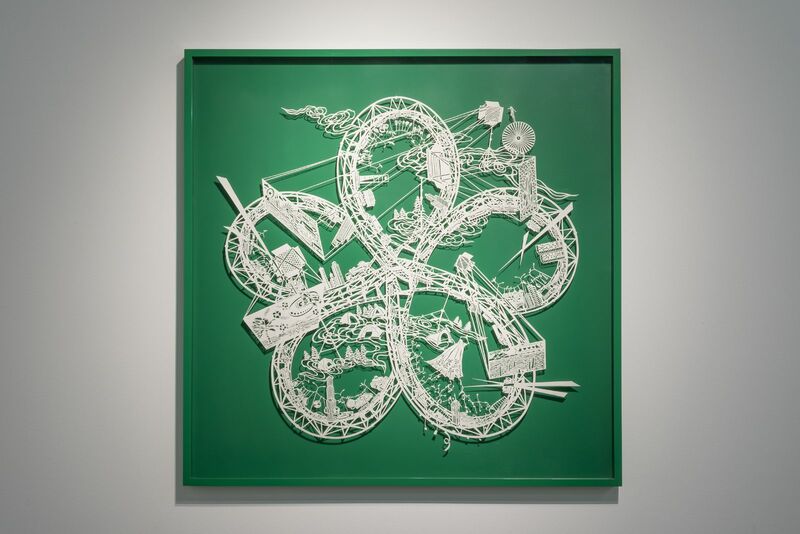 Taking inspiration from the overwhelming nature of a cross-country move, the works are predominated by a motif of rollercoasters winding their way throughout the pieces and often forming the perimeter of the cuttings. The title of the exhibition itself takes its name from an actual rollercoaster, the world’s tallest water roller coaster located in Italy. 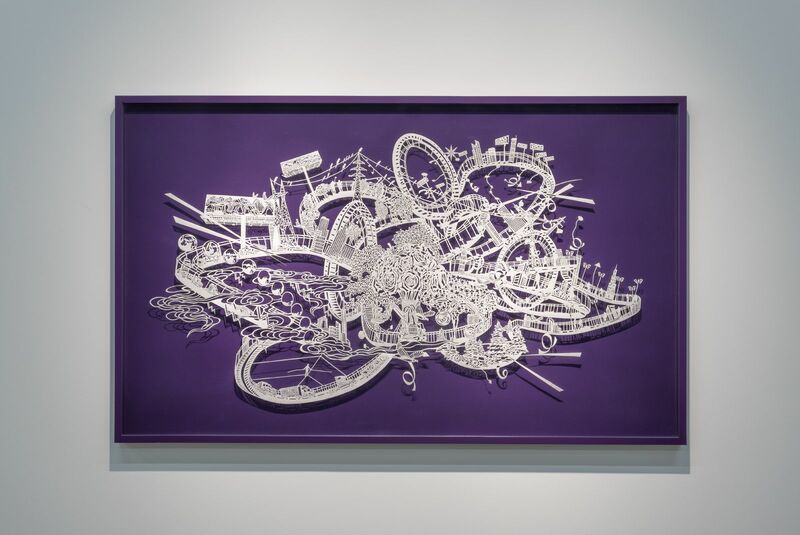 Embedded within each work – contrasting with the chaos of the rollercoaster and the natural and urban elements that fill the work – is evidence of a small balancing act, depicted in the form of a tightrope walker, an acrobat, or a surfer carefully balanced on his board. 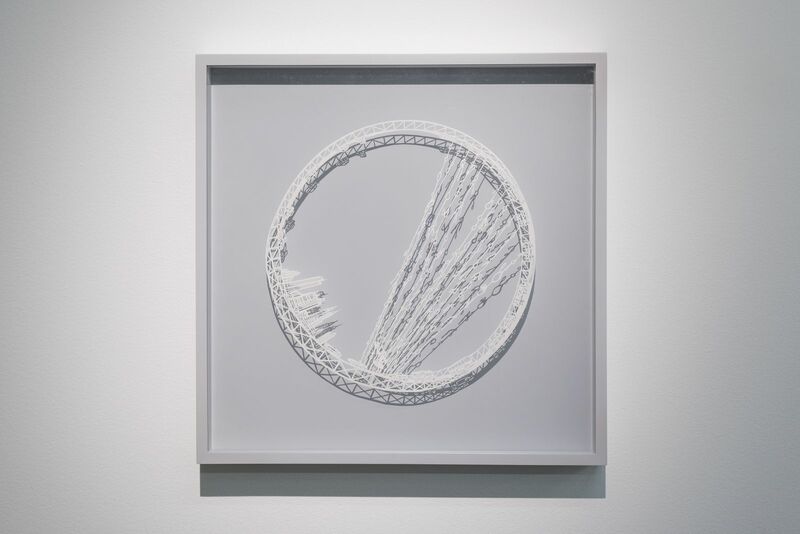 Speaking to the motivation for her move, the works also feature imagery associated with romantic relationships – wedding bouquets, engagement rings, cakes, and eternity symbols populate the pieces. 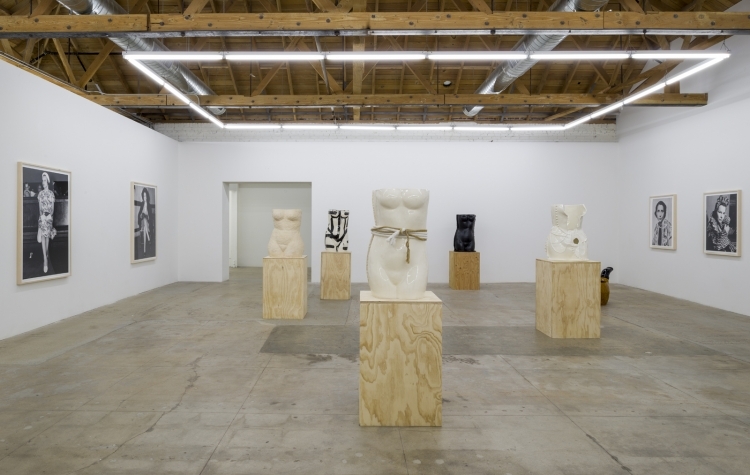 In the front of the gallery is Amy Bessone’s In The Century of Women, a combination of sculptures and prints concerned with the female image. The large bronze and ceramic sculptures contrast the female torsos on pedestals with the large pipes on the floor that perhaps suggest the male onlooker. The prints on the wall are “based on discarded images of divorcées from newspaper archives, dating from the 1930’s-1970’s.” They invite viewers to imagine narratives for these women who in certain instances stare out at you from their moment in time. Both of these exhibitions close 3/5/16. 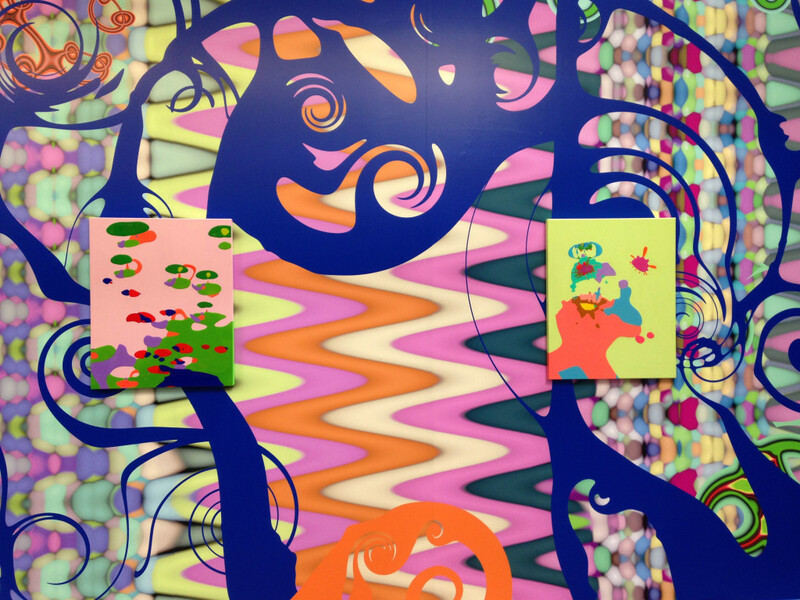 Today (10/24/15) is the last day to see Jose Alvarez’s multi-colored, multi-textured wonderland-(D.O.P.A.) 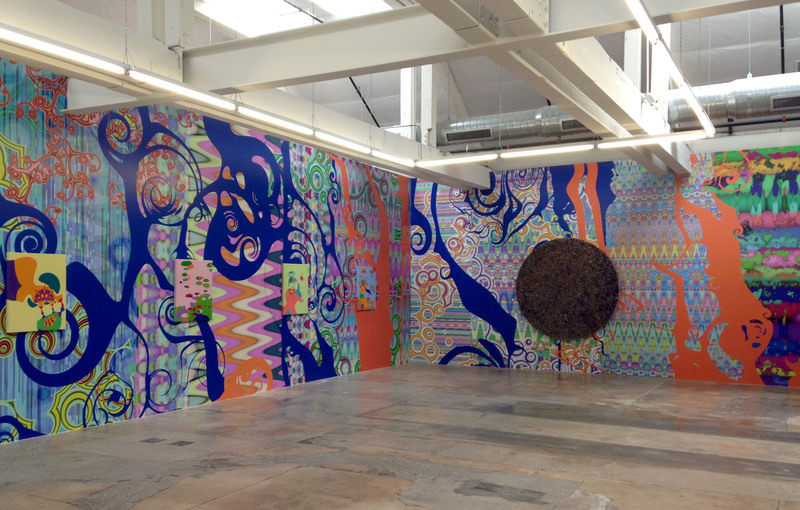 “We’re All Made of Star Stuff” at Gavlak Gallery.